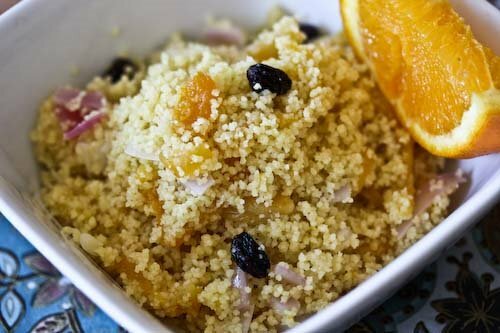 There is a way to make couscous, an authentic way, described by Paula Wolfert, which requires not only a specialized couscousiere, but many steps of washing, drying, steaming once, drying and steaming again. You can imagine with each step the little beads swelling more and more completely, filling themselves up with fragrant steam rising from the rippling stew below. This process coaxes flavor slowly and patiently into the couscous, without allowing it to clump. I am sure the results are worth it. One day, I will be certain. But for this recipe, the name of the game is quick and easy. Actually, the name is flavorful and delicious, or bright and summery, or healthy and satisfying. All of these things, in one delicious package. Actually, I kind of can't get over how flavorful this couscous is, and that might be because of it's unlikely source. I'm admitting to my slight hippie tendencies when I tell you that I found the original recipe in Jessica Porter's The Hip Chick's Guide to Macrobiotics. And if other recipes from this slightly wacky work end up being this good, it will officially be a hidden little gem. I'll be sure to let you know. In the meantime, embrace your inner Bohemian and enjoy. Place the couscous in a medium size bowl. In a saucepan combine the water, orange juice, olive oil and 4 teaspoons of the vinegar, seeing 1/2 teaspoon aside, and a pinch of salt. Bring the mixture to a boil, then add the dried fruits and ginger. Let simmer for about 1 minute, then pour the mixture over the couscous and give it a quick stir to make sure to get rid of any dry pockets. Cover the bowl with plastic wrap and allow the couscous to cook off the heat for about 20 minutes. In a small pot, bring some water to a boil (about a cup should do) and drop in the diced red onion. Let it boil for about half a minute, then remove with a slotted spoon to a small bowl. Toss the onion with the remaining 1/2 teaspoon vinegar and with the soy sauce. As you stir, the onion with turn a lovely pink color. 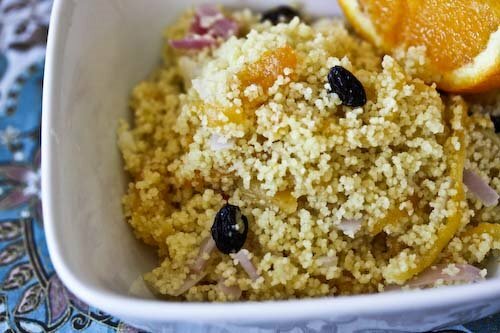 When the couscous is finished cooking, fluff it with a fork and add the onion and nuts. Enjoy with a great big smile. This looks great, what a unique dish! I love dried apricots. One of my favorite dishes to make is a Moroccan tagine. I usually just make plain couscous with it, but this would be 1000 times better. Plus much prettier! This couscous sounds amazing! I'm making this for my sister and me tomorrow, thanks! Andrea, I love couscous serve this way, I really do! I can't wait to check out Paula Wolfert's method (I had no idea there was such an extensive process for making cous cous). In the meantime, I will definitely try this recipe. The flavor combination of orange, apricot, and onion pushes all my buttons. Thanks! What a wondeful mix of flavors. Sounds perfect with a seafood dish and it looks delicious! Andrea, this looks fabulous. I love that slightly sweet flavor that the dried fruit adds. I'm definitely making this, SOON! Thank you so much for sharing all of these wonderful recipes. I love the flavors in your couscous... I had made walnut & mint one recently will post soon. YUM! This sounds like a winning recipe, one that I'll definitely make. I love the combination of flavors and the fact the dish is easy to make. Thanks for sharing it! costa rica homes for sale i didn´t see an apricot tree. Now i am really happy.